Recently I was out to dinner with some girlfriends and one of them ordered Fire Roasted Artichokes for an appetizer. 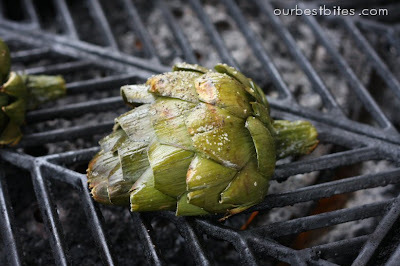 I had been wanting to try grilling artichokes at home, but had never gotten around to it. When we were digging into the appetizer I realized it would be super easy to re-create the dish, especially since the dipping sauce the restaurant served with it tasted just like my Garlic-Herb Spread. A match made in heaven! 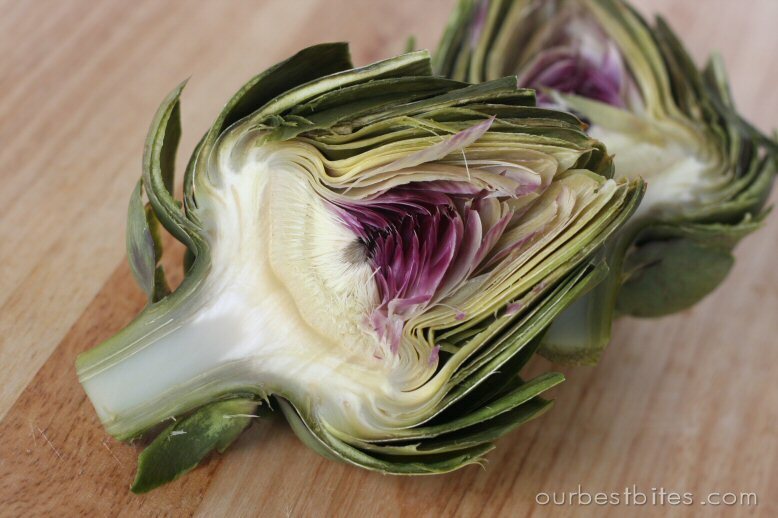 This time of year you can find artichokes readily available in grocery stores and just one large one can feed 2-4 adults. I’m actually not a huge fan of regular steamed artichokes, but grilling gives them amazing flavor, plus they just look cool. Try this for your next get together and it will surely impress! 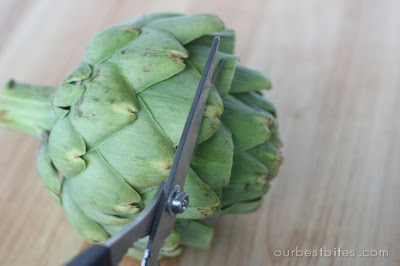 First here’s a little tutorial on preparing an artichoke. This goes for if you’re going to just steam and eat as well. 2. Trim the bracts– the pointy ends of the leaf looking things are sharp and poky so just take a pair of kitchen shears (or a clean pair of scissors) and snip the tips all the way around. You can take a sharp knife and just cut off the very top. I left it as is because I think it looks prettier when sliced in half, but that’s your call! 3. Steam– At this point your artichoke is ready for steaming. Even if you’re grilling your artichokes like I will be, you still need to steam them first. 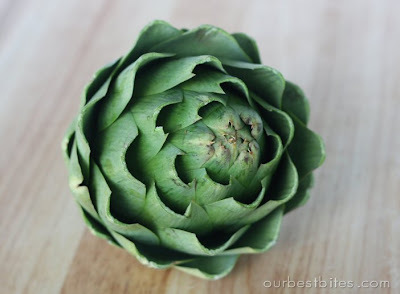 Bring to boil a couple inches of water in a pot with a steamer insert (a mesh strainer will work if you’re in a pinch), place artichokes in stem side up and cover pot with a lid. 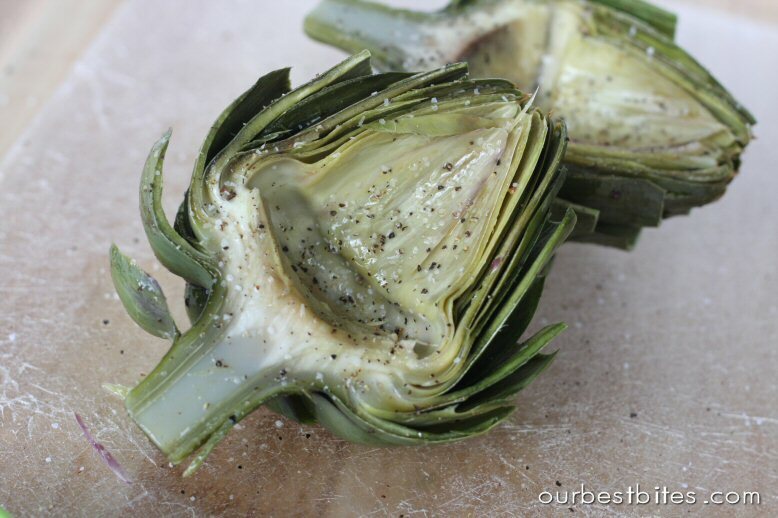 If you are going to eat your artichokes just steamed then they’ll need to stay in there for anywhere from 30-60 minutes depending on the size. For these Fire Roasted Artichokes, just steam for 20 minutes and then remove and let cool until cool enough to handle. 5. Remove the choke– that funny looking furry thing is the choke. 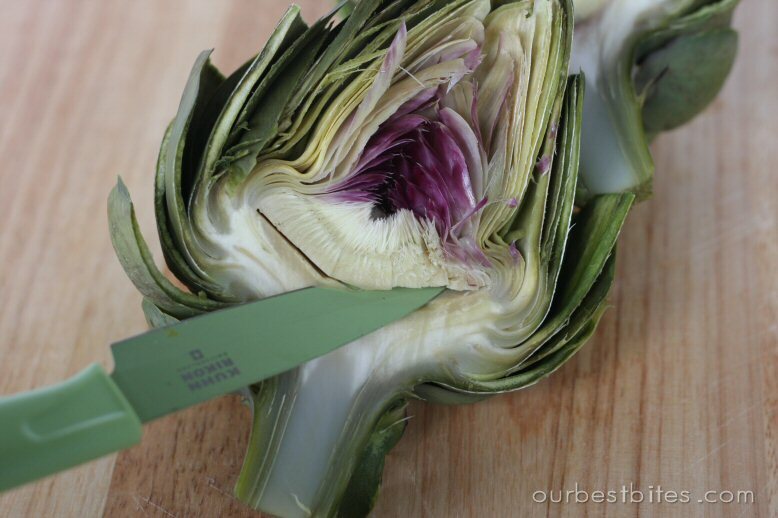 This part is pretty easy because artichokes are kind of color coded to show you what to do! All of that purple stuff needs to come out. Then just cut as the picture shows to make the choke removal easier. 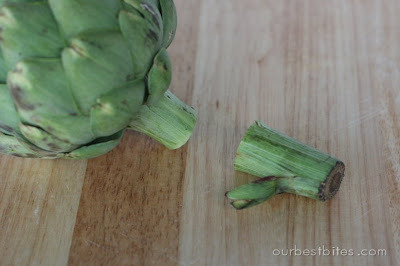 Note that these parts of the artichoke are not edible. Also note that this isn’t the “heart”. After you make that slice shown, just use a spoon to scoop it all out. It should come out pretty easily. 7. Grill– place artichoke on a preheated grill (medium heat) center side up. Grill with lid closed for about 10 minutes and then flip so the center is on the grill grates (shown below). Continue grilling for another 5-10 minutes until you have nice grill marks and the flesh appears soft. 8. Serve and eat! Place on a serving dish with your desired dipping condiments. We love this Garlic-Herb spread and melted butter is always a classic. 2. Trim the bracts– Take a pair of kitchen shears (or a clean pair of scissors) and snip the tips all the way around. You can take a sharp knife and just cut off the very top. 3. Steam– Bring to boil a couple inches of water in a pot with a steamer insert (a mesh strainer will work if you’re in a pinch), place artichokes in stem side up and cover pot with a lid. 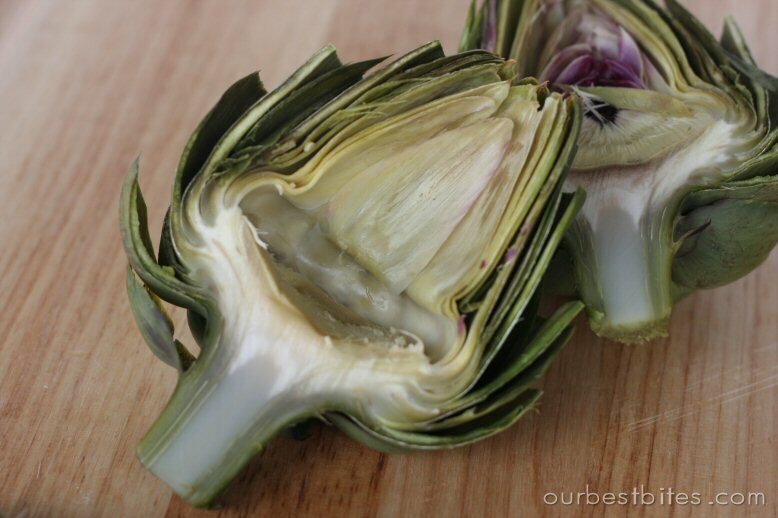 If you are going to eat your artichokes just steamed then they’ll need to stay in there for anywhere from 30-60 minutes depending on the size. For these Fire Roasted Artichokes, just steam for 20 minutes and then remove and let cool until cool enough to handle. 5. Remove the choke– remove purple flesh and use a spoon to scoop at choke. Slicing with a knife will make choke removal easier. 7. Grill– place artichoke on a preheated grill (medium heat) center side up. Grill with lid closed for about 10 minutes and then flip. Continue grilling for another 5-10 minutes until you have nice grill marks and the flesh appears soft. I love artichokes! We are going to have to give try! We love artichokes! What do you do with the scooped out heart? That's the best part!! Can't you grill it with that included? If you’ll notice in the notes, you are not removing the heart of the artichoke. The piece you remove with the spoon is non-edible. Our bbq arrives on Thursday and I can't wait to try this out on it! I have some in the fridge right now, will definitely be trying it out this week! 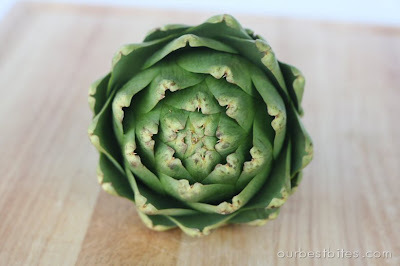 Perfect timing for this post- I am grilling artichokes tomorrow night for the first time and wasn't sure quite how to go about it. Thanks for the step by step instructions! I'm also curious why you can't grill the heart – I always thought that was the best part too! The artichoke heart is still there! You guys are confusing the choke with the heart. The purple part and the fuzzy part are *not* edible, that's why you remove them. The actual artichoke heart is below that where it connects with the stem. It's confusing because it looks different in this form than it does when you purchase artichoke hearts in a jar. Um, 2-4 adults? Ya right, I don't share my artichokes. Love them, but I have never roasted them before. I will definitly be trying this out. haha, okay so 2-4 adults at MY house, lol. You better make extra Laurel! thank you thank you thank you for posting this!!! I have been wanting to try cooking artichokes and the last time I tried I totally butchered them because I had no idea how to cut or prepare them. So I'm excited to try this. Who knew getting the choke out was so easy? I always end up with those little furry bits all over my fingers and the heart. wow. I've never had artichoke before but I think I might have to now! Thanks for sharing! Question – Do you eat the whole leaf once it is done. Sometimes the outer leaves are to hard. Awww, my mouth is watering. Have I ever told you how much I LOVE artichokes? I have already eaten probably 5 or 6 in the last 6 weeks. And I, too, have a hard time sharing mine 🙂 Anyways, a few weeks ago I was wondering about trying them on the grill, so this was perfect timing. I'll definitely have to try it! Oh that looks great. I love artichokes but have not grilled them before. This is an excellent post. I make artichokes as often as possible, but I don't think I've ever seen such a thorough tutorial on properly "dissecting" them. Kudos to you! Thank you!!! I love that appetizer at Cheesecake Factory and have always wanted to recreate it. I'm so excited to try it. Ohh, I can smell it! I have 8 artichokes just waiting for this! I asked some friends how they thought I should cook artichokes and they sent me here (which I already knew about…), should be yummy! I was seriously JUST wondering how to make these! Cheesevake Factory, right?! Soooooo yummy! thanks for this! Thanks, I’ve always wanted to try this! We will give it a shot tonight! Looks awesome! So we made these for the 4th of July… somehow they took much longer than 20 min on the grill- more like 40, and they still weren’t quite fully cooked. Should I plan on steaming them longer? I set my timer for 20 min steaming….BTW- despite the slight underdone of these we really enjoyed them, especially with the mayo dip which I used chives and basil to flavor. Yep, you just needed to steam it longer because that’s where the majority of the cooking is done. The grill just finishes it up and adds a little char! I made these for dinner today, and even though I am still working on mastering the grill itself, they turned out pretty good. I wasn’t able to steam artichokes, so I boiled them. Definitely will try again! My Mom has always boiled artichokes and I love them, may have to try grilling. But the sauce we dip them in is just mayo mixed with curry powder to taste. (I like it with lots of curry, I hate the taste of mayo).